Pancake Day, or Shrove Tuesday, is a day entirely devoted to pancakes. However, pancakes get much more dedication than just one day in my house! I eat them for my breakfast at the weekend whenever I have enough time to do so. I usually have blueberry pancakes drizzled with maple syrup. When I heard you could make pancake batter in a NutriBullet, and a healthier pancake batter at that, my mind immediately thought of adding Oreos. Trust me to put biscuits into a healthy recipe! This recipe for Oreo Pancakes with Raspberries & Creme Fraiche is a healthy treat, good for you, but with a little naughtiness mixed in. It’s also super easy and quick to make in your NutriBullet or food processor. 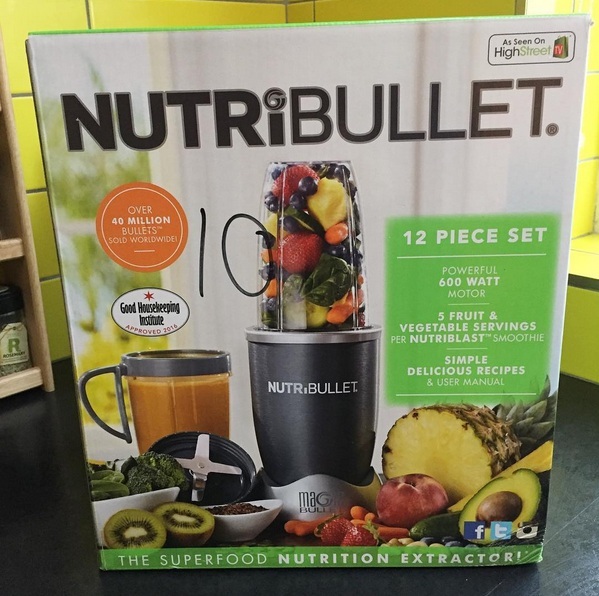 The kind folks at ao.com recently sent me this fab NutriBullet, a product which I have been wanting to purchase for ages, and in fact I wasn’t far off buying one when this lovely offer from them came along. I was so excited when it arrived. The first thing I made in it was these Oreo pancakes and it’s such a fantastic idea to make things other than smoothies in it. It could be used in lots of different ways to assist with your baking, for example whizzing up biscuits to make cheesecake bases, or nuts and dates if you’re making a healthier option. It could also be used to purify fruits for sauces, or mash up bananas for banana bread. I started by heating up a little oil in a frying pan. 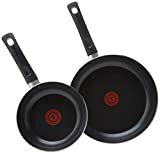 I used a silicone brush to coat the pan with the oil as this gives a light coverage so you don’t need to use as much oil. I used vegetable oil, but coconut oil would also be a good option. I put all of the ingredients into the large cup of the nutribullet and whizzed them up. It took literally seconds to blitz it all into a smooth batter. I poured the batter into a bowl and broke up the Oreos into it, then stirred them in. I wanted to make small American style pancakes so I used a ladle to pour a small amount of batter into the frying pan. I fried the Oreo pancakes until they were golden on both sides. I served the Oreo pancakes topped with creme fraiche (I used a half fat option), fresh raspberries and a drizzle of maple syrup. They were hearty and filling, and tasted wonderful. The creme frachie with the oreos gives that ‘cookies and cream’ flavour. These Oreo pancakes would make a fab weekend treat, and kids will love them too! I’m linking this up with Cook Blog Share hosted this month by Hijacked By Twins, with the Sunday Fitness & Food Link Up hosted by Ilka’s Blog and Marathons & Motivation, and with The No Waste Food Challenge hosted by Elizabeth’s Kitchen Diary as I was using up the leftover oreos I had from making a Strawberry Milkshake Oreo Cheesecake earlier in the month. NB. Recipe adapted from Jamie Oliver. I was sent the NutriBullet for free to try out, all opinions are my own. You can find more of my Dessert & Pancake recipes by clicking here! Pinned! I could definitely get my 3 teens to eat wholemeal pancakes if they had Oreos in. Thank you for such a brilliant recipe and I look forward to trying them. Thanks Sammie! I really hope you and your kids enjoy them! What a great idea! And they look really light and fluffy as well. Delicious! Thanks Katherine! They were really light and fluffy! It was so smooth and literally took less than 30 seconds, I was so impressed! Haha! I don't let my boyfriend know there are any left otherwise it'd be a non-existent concept for me too!